NEW CATALOG ONLINE of this exhibition, Follow links below for images, sizes, prices and more information on over 260 traditional African stools. Stools indicate status, power and succession of chiefs and kings. Carved from single blocks, Asante (or Ashanti) stools traditionally have crescent-shaped seats, flat bases and complex support structures, which exist in many designs with symbolic meaning. Most had specific names and designated users. Asante stools are spiritual as well as practical. They were understood to be the seat of the owner's soul and when not in use were leaned against a wall so that other souls passing by would not settle on it. Stools indicate status, power and succession of chiefs and kings. Carved from single blocks, Asante (or Ashanti) stools traditionally have crescent-shaped seats, flat bases and complex support structures, which exist in many designs with symbolic meaning. Asante stools are spiritual as well as practical. They were understood to be the seat of the owner's soul and when not in use were leaned against a wall so that other souls passing by would not settle on it. Most Bamileke art (and the work of other kingdoms of the Cameroon Grasslands) relates to kings and important chiefs, who defined their power by the display of prestige objects during important ceremonies. Stools were among the most important of these objects. The motifs include leopards, human figures and heads, spiders, lizards and other subjects plus abstract designs. The spider, often found abstracted in repeating patterns,is a symbol of wisdom. The leopard; cunning, fast, mobile and guardedly aggressive, signifies the ability to survive and is the most important royal icon, often even the king's alter ego. Glass beads embellish the most important royal stools. We are also showing 3 Bamileke beds. Small wooden stools serve the Dogon people for everyday use. There are two distinct types. The simple, abstract ones that we have are very old and wonderfully eroded by time, use and exposure. 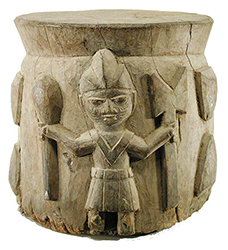 The more complex ones, supported by figures representing ancestors or nommo were originally symbols of authority for the priests or hogons and not used as stools. Those with a post in the middle are linked with Dogon mythology. The seat represents heaven, the base represents the earth, and the post represents a tree, linking the two. 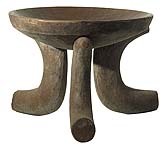 Probably from the Galla people of Ethiopia, these stools are simple but elegant, and are noted for their deep, concave surface. 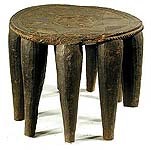 Although the elegantly carved, three legged stools are considered everyday objects, the ones with high backs are especially carved for chiefs and are often referred to as chief's chairs, or thrones. They were used during judicial and initiation ceremonies and share their form with the neighboring Nyamwezi, Zoromo and other peoples. Stools are a minor art form for the Igbo, who are better known for their masks and figures, but these two examples show good design and careful execution of detail. Stools are a minor art form for the Kuba, who are better known for their masks and textiles. We have two types, both of which exhibit the Kuba love for abstract patterns. Lobi stools, carved from single blocks of wood are wonderfully simple forms. Most of ours are aged beautifully by use and exposure. Many have heads as elements to make them special to the owner. Numbers1-6 are usually referred to as reclining stools. Most Luba art relates to kings and important chiefs, who defined their power by the display of prestige objects during important ceremonies. Stools were among the most important of these objects. The ruler was literally as well as figuratively supported by a female caryatid figure, which also symbolizes the continuity of power in a matrilineal society. Elaborate coiffures and scarification patterns attested to the high rank of both the depicted female and the owner of the stool. These stools are among the most prized in Africa. The Luba are also known for their figurative headrests, which helped to protect their elaborate hair styles. Numbers 2 & 29-32 have disctinctly Tabwa hairstyles, 2 & 30-31 have Tabwa scarification patterns. Moba stools, carved from single blocks of wood are wonderfully simple forms, not unlike Moba figures, which are much better known. The two stools we have are aged beautifully by use and exposure, but no. 2 has some middle pieces obviously missing. Most Nupe are Muslim and their art is therefore abstract, with only some stylized animals in relief on their doors and some pots. The stools come in many forms yet are all carved from single blocks of wood. All share a richly carved top surface. Stools are a minor art form for the Pende, who are better known for their masks. We have two uncommon, but fine examples of their stools. Usually called Pygmy stools because of their small size, these may have been ceremonial rather than functional, or made for children. The figures are similar in style to the small Namji ritual dolls from Cameroon. Senufo stools, carved from single blocks of wood are wonderfully simple sculptural forms. Most of ours are worn smooth on top by use. We have stacked them to show relative size and unintended sculptural possibilities. They are sold seperately. The Tabwa have stools very similar to the neighboring Luba, but they have disctinctly Tabwa hairstyles and Tabwa scarification patterns. Turkana stools, carved from single blocks of wood for everyday use, are wonderfully simple sculptural forms. Yoruba stools, like those of the Luba, related to kings and important chiefs, who defined their power by the display of prestige objects during important ceremonies. Stools were among the most important of these objects. The ruler was literally as well as figuratively supported by a male or female caryatid figure, which also symbolizes the continuity of power. Placed on altars dedicated to Shango, the Yoruba god of thunder, these objects that look like inverted mortars, depict Shango or devotees of Shango along with Shango's symbol, the double-headed axe. Shango is thought to control the great powers of nature as one of the orisha, or gods. They are all extremely heavy, of very dense wood, with only slight hollowing out on the bottom. They were repositories for Shango's ashe, or spiritual power. We have included them in our stool exhibition because of their size and appearance; they seem appropriate as stools for a god. These stools with high backs are especially carved for chiefs and are often referred to as chief's chairs, or thrones. They were used during judicial and initiation ceremonies and share their form with the neighboring Nyamwezi, Hehe and other E. African peoples. Click on a name to see a catalog with additional images and other views. The stools below have been sold and are left here for reference and educational purposes.